Protea Hotel Pelican Bay overlooks one of the most important wetland areas on the African Coastline, the Walvis Bay Lagoon, declared a Ramsar site to ensure that its protection is guaranteed by the Namibian government. With uninterrupted view of the Walvis Bay Lagoon, where dolphins are often spotted playing in the water, Protea Hotel Pelican Bay offers 50 comfortable en-suite rooms, a restaurant, bar and coffee shop, as well as secure parking and conferencing facilities for up to 150 GUESTS. 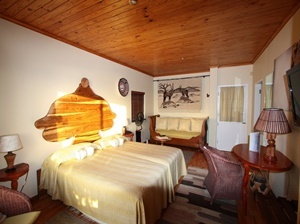 Egumbo Lodge is an 'elegant colonial lodge' overlooking the Walvis Bay Lagoon. Egumbo is a local word meaning 'home'. One of the most popular bird watching spots is at The Raft Restaurant, built on stilts in the lagoon and crossed by a short bridge. Amenities at Egumbo Lodge include a restaurant and bar, wine cellar, lounge with fireplace, heated swimming pool and the intriguing 'whiskey corner'. A hot and cold buffet breakfast can be ordered and in the evening diners can enjoy Mediterranean cuisine from an 'A La Carte' menu. Wireless internet access is available throughout the premises, secure parking and a baby sitting service are also offered. Accommodation is in a total of 8 rooms. 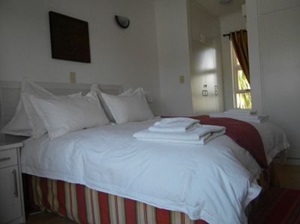 7 double rooms are equipped with queen-sized beds. Central heating, espresso coffee machine, wireless Internet access, flat-screen TV, a hair-dryer and a room safe are standard. Some of the rooms have a bath, others a bath and a shower or a shower only. The Single Room has a double bed and is equipped with a shower only and similar facilities to the Double Rooms. This is the largest room in the lodge and has a sofa and a bathroom with a bath and a shower. Lagoon Loge overlooking the Walvis Bay lagoon, offers eight cosy individually decorated rooms, all with a veranda or balcony with a sea view. 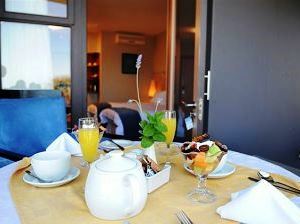 Included in the service is a gorgeous breakfasts: a wonderful place to enjoy an unforgettable stay at the Namibian Coast. 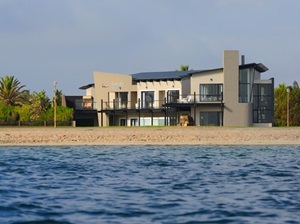 Located on Walvis Bay's beautiful Lagoon, Oyster Box Guesthouse offers classic comfort. A section of Oyster Box Guesthouse faces the bay. Downstairs is the reception and lounge with an outside porch that doubles up as a beach bistro open to the public which serves a choice of drinks and light meals. The breakfast lounge and 2 terrace areas are located upstairs. Lunch packs can be ordered for those on day trips and activities. Light meals can be ordered in the evening but the owners/management can recommend any one of 3 known restaurants within walking distance of the guesthouse, including the nearby Raft. After dinner enjoy a sundowner in their 'sheltered' lounge and bar.There are 12 single or double rooms located on both the ground and upper floors. Most of the rooms upstairs have sea-views, some have balconies. En-suite bathrooms, air-conditioning/heater, DSTV hotel package and an in-room safe are standard. Wi-fi connection is available. The Langholm Hotel is situated close to the magnificent wetland of the Walvis Bay Lagoon and has 12 double rooms (ten with double beds, two with twin single beds) each with bathroom en suite, television, telephone, safe and fridge, one triple room (three single beds), one family suite with a lounge with kitchenette, a luxury room and a newly built luxury suite. The Langholm Hotel offers a gourmet a la carte dinner service to its guests every night and has a very festive bar which boasts a collection of over a 1000 caps/hats and a lounge where one can chill out in relative peace and quiet with a drink of one’s choice. Secure covered parking and both indoor and outdoor braai facilities are also available.